What do you do when Mrs. foodie is scheduled for duties at Competition Dining and can’t be two places at once? You send the Mr. to the other event! After all, he knows his food and he’s a great collaborator. 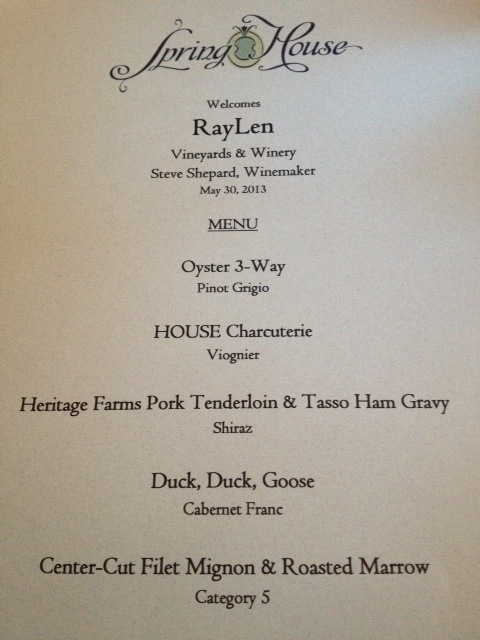 We were invited to Spring House Restaurant’s Wine Dinner featuring Yadkin Valley’s RayLen Vineyards of Mocksville. I love that more local restaurants are featuring NC wines and featuring them during upscale yet approachable dinners. Here’s a recap of the evening, starting with the menu. Now, since I was not present, I cannot speak to how everything tasted, but Chef Timothy Grandinetti is basically a master in the kitchen and you can count that ANYTHING at his wine dinners will be in the realm of “superb.” And Mr. foodie pretty much said everything was wonderful and he even liked the wines (for a guy who’s not as much a wine-oh! as me). Ha! Mr. doesn’t like oysters. But he says he liked the Rockafeller, enjoyed the fried one the best and sucked the raw one down like a good little foodie. This I wish I could’ve tried. A center cut filet with roasted marrow. Have you ever had marrow bones? Or braised a shank and scooped the marrow out of the bone? The part that is a little yellowish and soft and gelatinous is so yummy. It has a wonderful buttery texture and a meaty, farm-y, taste. Like your grandparents, if they lived on a farm, would’ve made that for you. Waste not, right? Mmmm. Some restaurants serve marrow bones as an appetizer. They are few and far between and it is unfortunate. Until then, I’ll do Osso Bucco at home and eat its marrow :). Apparently these lucky wine dinner folk got to have dessert even though it wasn’t listed on the menu. We North Carolinians, I believe, have been slow coming around to the idea of our being the next wine country. But it is happening. Our soil, landscape and the climate are very similar to other great wine regions. As RayLen’s Mr. Shepard will tell you, it takes years for the vines to start to really mature and yield great fruit for winemaking. And many local wineries are finally at that place. A good reason to give our local grape a try next time you are in the wine section. Or better yet, take one of the wonderful tours available to you and enjoy an afternoon. Some wineries have little cafes and restaurants and are definitely worth checking out. Until then, be sure to take advantage of wonderful wine dinners which lead you through interesting pairings and take you on a tasting tour you might not ever had been privy to. Plus you get to eat awesome food and meet some new foodies! Spring House is kind of like a “place to be.” Be sure to mark your calendar for Chef Tim’s, aka Dr. Brownstone’s, Sweet Summer Luv Luv Festival. It’s 5 days of deliciousness featuring chefs from all over the Triad and country serving up delicious food by grill or by whatever floats there boat. Find out more here. triadfoodies was invited as a special guest of Chef Tim Grandinetti and Spring House Restaurant along with several purveyors and was provided gratis food and drink. All opinions are our own. 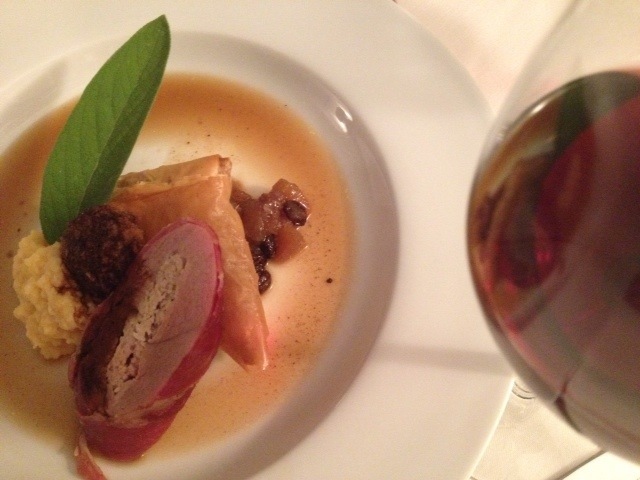 This entry was posted in foodie b'eat and tagged Wine Dinner, Winston-Salem on July 14, 2013 by triadfoodies. I need you to tell me about that Duck Duck Goose!